At Heaven's Gate: A layered mountain vista that encompasses comfort and affords ample privacy for a romantic getaway. 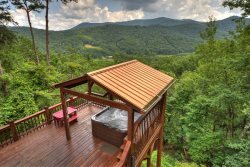 This beautiful log home located in the lush Cohutta Wilderness gives you spectacular views of the surrounding North Georgia mountains and easy access to and from your cabin with paved roads. As you step through the front door At Heaven’s Gate, your North Georgia mountain experience starts on the entry level as hints of smoke from the wood burning fireplace waft up your nose. Fully-equipped kitchen, washer and dryer, television with DVD/VCR, plush leather seating arrangements and cathedral ceilings add comfort to your mountain vacation. Sleeping arrangements on the entry level include plush queen bed, TV, and bathroom. Walk up the stairs and find another bedroom complete with queen bed, TV, and bathroom. Venture outside from the living room or master bedroom to the porch, and relax in your very own private hot tub as you gaze at the tranquil mountain views. Read a good book on the swinging chair, or sit around the table with friends or family and enjoy a casual lunch or dinner. The large grassy area is a great gathering space or kids play area. You and your friends or family will think that you’re At Heaven’s Gate after spending your vacation in this charming cabin! The house was really nice and everything was good but the shower in the upstairs bathroom wouldnt turn on the shower head when we tried to use it to take a shower so we had to shower in the one downstairs. Overall the cabin was really nice and I would definitely like to own it one day if it ever becomes available to be sold. Also I think that it would be really great if you guys would allow people to just rent the cabins for like a weekend for 2 nights instead of making it mandatory to spend like at least 3-4 nights because some people cant get time off to spend like 3-4 nights and maybe they could just come Friday night and Saturday night and leave Sunday so they can at least enjoy a weekend in one of your nice propertys. Everyone was very nice and accommodating. So friendly!! Any time we talked to them or had a question, before, during and after our stay was fantastic!! The property was beautiful! Very quiet and peaceful. We stayed in the Cabin called Heaven's Gate, and loved everything about it. It felt like being at home!! The SCCR staff is very pleasant. I chatted on-line with Kim a couple times and she cheerfully answered my requests and questions. The property was absolutely perfect!! The view, the set up of the rooms, fireplace and hot tub were everything we wanted and more than we expected. Usually the pictures are better than the reality. Not this time!! We are definitely coming back to Blue Ridge and renting another cabin through SCCR. Man, what can I say this place was more than I thought. The views were absolutely splendid. Property was great. It was just as it looked on pictures. Clean nice and cozy. Hot tube was a great experience out on the deck with a beautiful view of the mountains. Loved the fact that we had MovieFactory to watch and a few games to play to keep us occupied. I would definitely stay at this cabin again. We communicated with several different people, and every time was a pleasant experience. Everyone was was eager to help, and the response time was very quick! We were so impressed with the cleanliness of this property. inside the kitchen and bathroom cabinets were spotless. Even the pot holders were clean. Most cleaning services miss those types of details, but that was not the case with this property. I am super duper concerned about cleanliness, and we were super duper pleased with how clean everything was! Thank you soooo very much!!! Very nice cabin and fully equipped. We celebrated our 7th wedding anniversary on July 4th so we decided we wanted a cabin with a mountain view to get some R&R. We saw fireworks on July 4th from our deck. We loved it there. Kimberly was fantastic to deal with. She was very kind and extremely helpful. Wonderful service! My husband and I have stayed a several cabins in the mountains, this cabin had the most amazing view of flowing mountains. The cabin was quant. We were surprised upon arriving at the scenery. We were disapointed by the lack of condiments. This is the first unit we have stayed in that didn't provided spices, ketchup, mayo, etc. "So please bring your own". Outside of this the kitchen was fully stocked with pots, plates, silverware and pans. Everything you need to make a meal. The beds are absolutely amazing. The home is stocked with wonderful board games, and playing cards. This is a very relaxing ambient place. Yet, if you need to always be on the go this place might not be for you. "There is no internet" which we were ok with. We would recommend more toilet paper, condiments and bigger TV's. Overall we would definitely stay here again. Also, the grill is nice, and the hot tub is amazing! Great view and great place to relax!